Jasprit and I are big fans of Julie James' romances, and so we were thrilled to get our hands on a copy of her newest: The Thing About Love! 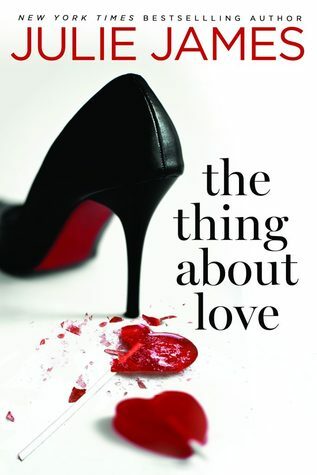 We're pleased to share our reviews, an excerpt, Julie James' book tour schedule and A GIVEAWAY (open internationally-see details below) of The Thing About Love! I hope you love this romance as much as we did! Jessica Harlow was one of two women in a class of forty-one FBI agent trainees, exceptional in the academics portion, but just okay in the physical part, making her insecure over those abilities. John had the opposite problem, being a former Army Ranger he excelled at the physical exams and skills on the firing range, but felt intimated by all the postgraduate degrees. At first they both really admire each other, but their respective insecurities played a factor in putting them at odds by the end of the class, and they left on bad terms. Six years later, they’re both back at the Chicago office, and assigned to work with each other; neither very excited at the prospect. I enjoyed being in on the procedures preparing for their case, and the actual undercover work. I was a little on edge over the inherent danger with their assignments, especially with one of Jessica’s cases. I liked how the past misconceptions that led to their mutual dislike were clarified quickly, and handled early on. After that, John and Jessica’s mutual respect grew, both admired how adept and good each were at undercover work, and the initial attraction they felt six years back starts to ignite all over again. Very hot! But with John leaving for a new assignment in only a few weeks they agree to keep things simple with no strings attached. After having problems with past relationships over the job, they’re happily surprised at the understanding and support each one provides when difficulties come up, and they just clicked on so many levels! Loved these two together! I was thrilled there was no unnecessary angst or drama with this realistic romance. What originally starts out as a temporary affair turns into yearning for more, and I was crossing my fingers they’d be able to make things work long term. 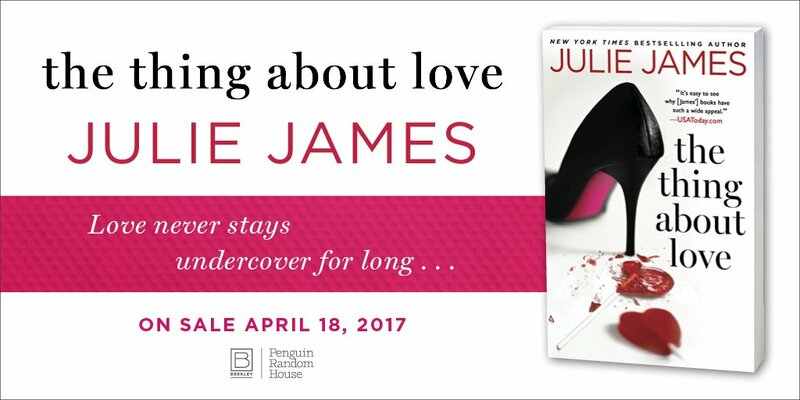 Julie James rarely disappoints! The Thing About Love grabbed and held my attention, from FBI procedure and casework, to John and Jessica’s past relationships and their current romance I wanted to last forever, I was captivated. 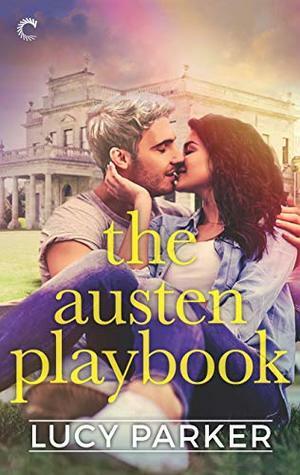 I have always loved James books, her antagonistic slow burn romances have always been favourites of mine, as she just makes them work really well! It had been sometime since I last read a book by James and when I heard about The Thing About Love honestly I couldn’t wait to get stuck in. Second chance romances are another favourite trope of mine and James once again does another great job of it in The Thing About Love. It was clear to me that there was something between Jessica and John underneath all the snarky and trying to wind each other up comments, although it seemed like they didn’t like one another, I just wanted them to drop all the pretences that they had been building these last six years and just see what could happen. Who knows maybe it could be something more wonderful than either could have imagined. I loved the situation that John and Jessica found themselves in, this situation really forced them to work in close contact and try and forget any issues that they might have had over the last six years. I knew this could be tough for them, as they were used to continually throwing jibes back and forth, but this undercover situation also required them to be as professional as possible. I loved watching the development of their relationship over the course of the investigation, the slow burn and intensity was a delight to see unravel. After the first explosive scene between Jessica and John I wanted more right away! And James truly kept me on my toes in the best possible way. The Thing About Love was a nice mix of suspense and romance, as you never knew which way the investigation would go and whether John and Jessica could finally find a way to be together. The Thing About Love was an absolute delight to read, I loved following John and Jessica on their investigation and the build up of their slow burn romance. This book has definitely put me in the mood to read more of James books right away! In response to his dry tone, she threw him a glare so cold it could’ve frozen all nine circles of Dante’s Hell. Fittingly, just nine of the many places he would rather be than stuck working with her on this investigation. The elevator arrived at their floor, and they both stepped inside. She hit the button for the seventh floor, where the public corruption squad was located. Standing on the opposite side, he pressed the button for floor five. They faced off as the doors shut. She folded her arms across her chest and studied him with those crystalline blue eyes that could so cleverly mask her emotions. Thank you, yes, being a professional, he was aware of that. He took a step closer. “It’s called “undercover” work, Harlow. If I can pretend to be a gun-buying, murder-for-hire thug, I think I can handle playing some rich investor-type who wants to skirt a few measly zoning laws.” Even a rich investor-type who was apparently masochistic enough to get in bed with the likes of her. “Measly zoning laws?” she repeated. Ooh, now he’d gone and pissed her off. How nice it was, really, that they could pick up like this, right where they’d left off. She drew in closer, tilting her head back to meet his gaze. He was over a foot taller than her, although he noticed that she was heightening a bit with those expensive-looking three-inch heels she wore. He watched her stride confidently down the hallway as the elevator doors closed between them. Enough to get the jump on you. Time for him to get cracking on that case file. We're giving away a copy of The Thing About Love to one Readers Den follower. The giveaway is open Internationally as long as The Book Depository ships to your country. If you live in the US you may chose to have an e-copy through US Amazon or US Barnes & Noble. Just fill out the rafflecopter below for a chance to win. Good luck! 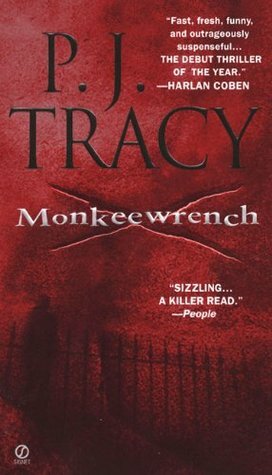 I have heard such good things about this author and this book lately!! Glad you both enjoyed it too. Great reviews!! Thanks so much for sharing this it sounds like fun read! I love a good slow-burn romance! I feel like I've been seeing posts about this book left and right. So happy the book did not disappoint either of you. :D Wonderful review, ladies! I haven't read this author before, but now I want to. I adore a good anatgonistic romance and I like the whole undercover thing. I'm so glad you both enjoyed this one! I thought it was super cute and loved the set-up, but it somehow lost me in the middle of the love story and I wasn't as invested in this novel as some of her others. Still, Julie James is hard to beat and I'm going to pick up whatever she writes. Wonderful reviews, ladies!! My first read was Just the Sexiest Man Alive and I loved it! I have been a huge fan ever since so that remains my favorite. Altho It Happened One Wedding is a very close second! Thanks for the chance to win! I haven't read anything by the author but I like the sound of this one. Slow-burn romances can be great. Thanks for both of your reviews! I love the sound of this one! I've never read a book by the author but I love this premise and am so happy to see you both enjoyed it! so glad to hear that you two enjoyed this one because I was starting to get nervous with some of the mixed reviews. It looks good and it sounds like something I would enjoy so I hope to read it.